What’s for dinner? 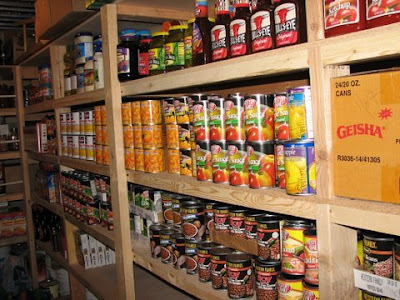 Let’s see what’s in the basement “store”… Many people have asked to come and see my food storage room, so….here’s the big unveiling :0) There are probably many more organized and well stocked food storage rooms out there, but here is mine. My sister talked me into having a blog, so we are dedicating this blog to all of the food storage “nuts” out there like me. We are hoping this blog will inspire you to get your year supply, be a place where we can share helpful tips and a place to post our accomplishments and encourage each other to continue becoming prepared. Everyone will store and organize their food storage differently, but the important thing is that we are all working towards our goals. 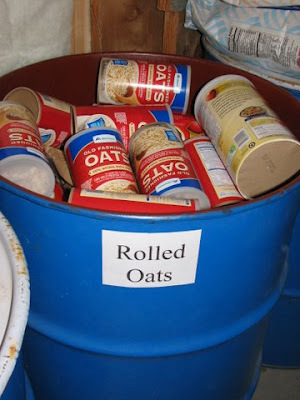 So…here we go with some food storage tips that work for me–hopefully they will help you to. If you have any tips that work for you (or pictures) email me at shandra@dealstomeals.com and I will post them for all to see–or just post a comment. 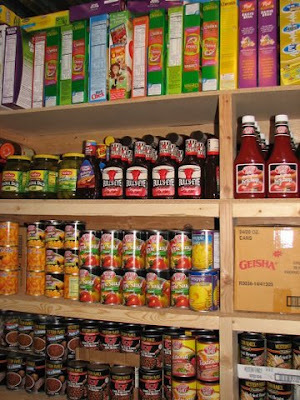 First…you need a way to organize your food–wood shelves, metal shelving, rolling storage units, etc. My husband built these shelves-aren’t they cute?? 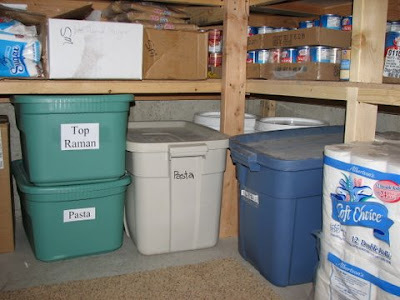 I organize my food storage room into categories. I try to keep all like items together-Legumes together, fruits, vegetables, oils etc. It makes it easy to glance and see what I have and keep an accurate inventory. Remember, grains aren’t just wheat, grains includes pasta, rice, cornmeal, cereal, oats, flour, cornstarch, etc. 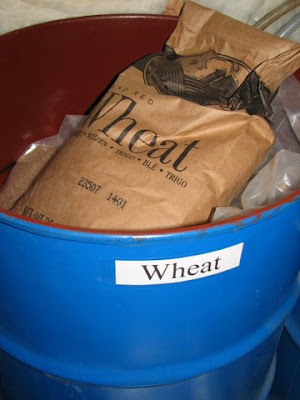 How do you store your grains? It is more expensive to can all of your grains in #10 cans, so I put them in plastic Rubbermaid totes. I go through my food so quickly, I have never had to worry about weavil or food going bad. 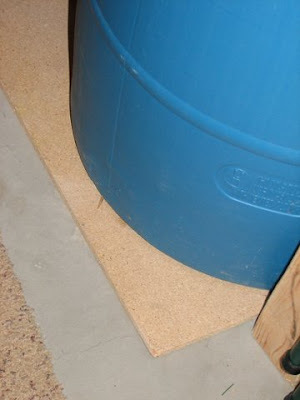 The plastic tubs also keep your food dry and away from rodents. It works for me and is an inexpensive way to store your food 🙂 You may think 48 bottles of BBQ sauce is excessive? I don’t–I know I will use it in the next couple of years, so why not stock up when it goes on sale for .60 (or .05 each with a coupon)–fabulous! Remember, if you don’t get funny looks from fellow grocery shoppers, you are shopping the wrong way 🙂 Buy as much of each item on sale–even if people think you’re crazy for having 69 bottles of ketchup (okay, so maybe I am a little! ), you will save SO much money in the long run! Since we all know we live in earthquake territory, my brilliant husband came up with the idea to put PVC pipe into the sides of the shelves to keep bottles and food from shaking off the shelves. Is anyone thristy? The church recommends AT LEAST 14 gallons of drinking water per person for a two week supply. I have our drinking water in the form of water bottles because they are convenient and easy to rotate through. The water in the drums are for washing, cleaning and cooking. I don’t think it is possible to have enough water! 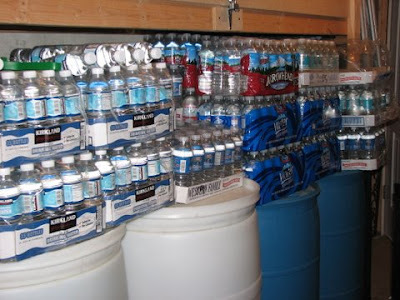 Visit our website under the Free Downloads tab and see the recommendations on storing water. One thing that is important is to not have your water bottles or drum directly on cement. We have a piece of plywood under and on the side of our water drums. 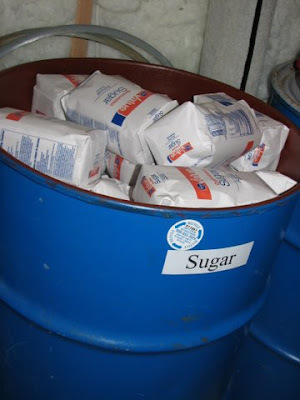 Okay..so you have heard me talk about storing your flour, oats, sugar and wheat in large Rubbermaid garbage cans. A friend who was moving gave us these wierd looking large drums that we keep our “bulk” food storage items in. I’m sure you can’t find these wierd looking blue containers anywhere–I know you’re jealous of them-haha!–so, large plastic garbage cans should do the trick. FLOUR: APPROX. 75 LBS. PER PERSONThese large drums holds close to my families year supply of wheat, sugar, oats and flour. I only buy these items once a year (because I buy a year supply when it is on sale for “red/great” prices. I label the individual bags with the date I purchased them (ex. 4/08) to help me make sure I use the oldest bags first. I then take out the old bags, put the new bags in the bottom and then put the oldest bags back on top. If you are only buying them once or twice a year, it’s pretty slick! These drums keep your food dry and rodent free–it’s lovely (and VERY cost effective). OATS: 20 LBS. PER PERSON WHEAT: 100 LBS. PER PERSON SUGAR: 65 LBS. PER PERSONBesides the long term storage, it is important to have food in your freezer. Having a 1-3 month supply of meat, butter, cheeses, vegetables, bread, tortillas, seafood, etc. make meal planning MUCH easier. When meat goes on sale for “red/great” prices, stock your freezers and save HUNDREDS of dollars! Many of you are probably saying you don’t have room in your garage/home for a freezer. 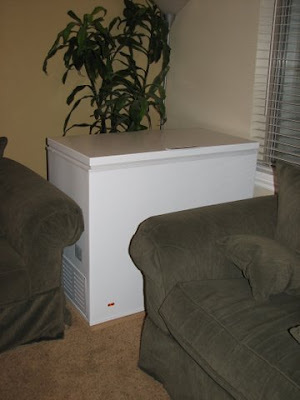 Just do what my sister did and use it as an end table 🙂 You don’t need to have a large deep freeze (although I LOVE mine), you can get a smaller 11 cubic feet freezer for around $250. You will save that much in just a couple months. Wow! How’s that for my first post? I promise they won’t always be that long–however, by now you all know I can get a little winded when I’m talking about something I am passionate about :0)So…what works for you?? Share your thoughts, ideas, tips, etc. and hopefully we can all get excited about being prepared. It is a great feeling! Don’t get discouraged if you don’t have your year supply. The important thing is that you are working towards a goal. Anything will be FAR BETTER than nothing in an emergency or if food prices continue to skyrocket and the economy takes a turn for the worst. I love the quote from President Hinckley, I think it is so encouraging, he said, “We can begin ever so modestly. We can begin with a one week’s food supply and gradually build it to a month, and then to three months. . . . I fear that so many feel that a long-term food supply is so far beyond their reach that they make no effort at all. “Begin in a small way, . . . and gradually build toward a reasonable objective. Shandra–WOW! 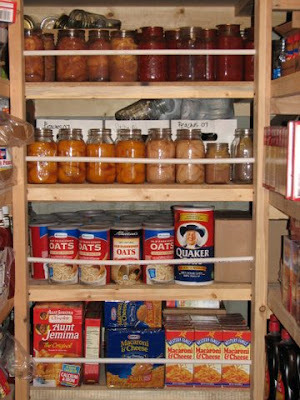 I am SO SO SO Impressed with your Blog and especially your Food Storage! It gives me an idea and vision of what I want my food storage to be like! You are the most organized person I know! Thanks for sharing your talent! You are awesome and amazing! I am so glad we are friends! Thanks so much for all your great tips and ideas. 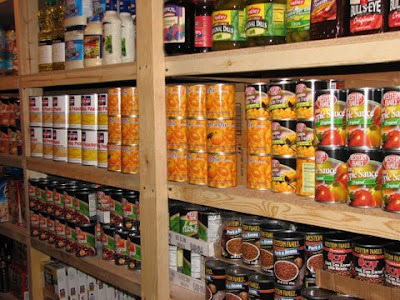 My dad is a food storage junkie and loves your ideas! Thanks for taking time to share with all of us! You Rock!!!! One day I want to grow up and be like you! Wow! I love the pictures! You have helped me so much with my food storage. I am so inspired with the alternative storage containers. I have spent so much money on 5 gallon buckets. The PEETE and PTVD has stressed me out! I had to post a picture of my cereal on my blog. It seemes extreme to buy 52 boxes but it is so worth the saving! Thanks for all you do! Thanks for doing this! Because of you I have begun my food storage and am making progress…a little at a time. I'm the Provident Living Leader in our ward and my sisters have gone bonkers over your web-site and we are always checking up on one another making sure everyone got their deals. This common cause has brought us so much closer together. The generator at checker Autoparts is also at Cabella's and is an excellent generator as far as gigawatts and who'sywatts. Someone who really knows bought 3, for his extended family. He had a 25% of coupon to boot. He got it in some package of coupons you get when you move. Remember, the generator deal ends this week! Thanks Shandra. You are a blessing to so many and I'm glad you are willing to share this talent of yours. You are a very generous person and will be blessed. Thank you so much for all that you do. I learned about your site from a friend, and have joined. My husband says that he is still waiting for the savings to happen, (because I started right when there were great sales going on), and so I really stocked up. It is nice seeing food stocking up in the basement. I showed my husband your pictures in hopes to inspire him to make me some shelves, and a better way to store my food. I think this will only work, if I have a way to see what we have. Did your husband have some type of building plans when he made your shelves…how deep are they? I hope I can get my husband to see how important it is to make storage "user friendly," because I think that it was the only way this will work. Thanks again! shandra- You are amazing! 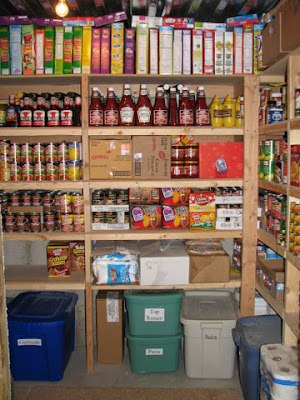 I think I am doing pretty good, and then I see your "mecca" of food storage. Maybe when I'm grown up and as old as you are (ha ha) Thanks for all your help! I made Derek come in and see your pictures! We are jealous! Someday – at least we are on our way! Very impressive! I need you to come live in Texas and figure out where I can put all this food and still be rodent/bug-free! Oh how I miss basements and cold food storage rooms. I'm having such a difficult time finding toilet paper on sale. What is considered a good price for name-brand tp like Quilted Northern ultra? thank you! thank you! thank you! You are an insperation! the food storage thing is so over whelming but you make it doable! I tell everyone about your site. i still need to sighn up. I am about to reorganize my food storage room and looking at your pictures, I am wondering if there is a reason you put your bottled fruit on a shelf with a doul instead of on the floor, where it would be less likely to break? Does it need to be off the cement like the water bins? Okay, I am really enjoying your blog and am excited about food storage now thanks to you! But I have one question- I have no problem organizing and storing items in my pantry and downstairs, but what about the freezer? I have 2 small chest freezers and things tend to get lost in the bottom! 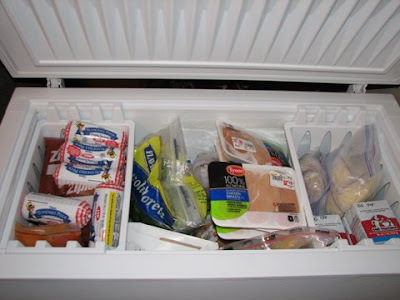 How do you keep your freezer organized so you can find the things you want and use them up before they go nasty?? Why would you buy a thousand little bottles of water? I store my water in 5 gallon jugs. I love your blog!!! Thanks for sharing your knowledge and pictures with us. This is definitely an inspiration. I found this post way back last year and linked to it on my preparedness blog back then. Now I'm linking to it again on my Fruitful Vine blog because it is so worth sharing. I definitely caught the vision and still hanging on to it. Thank you so much. Just discovered your blog 😉 Very fun and inspiring. One quick … You may be suprised, but rats can chew through those plastic Rubbermaid bins. When we lived in CA (Turlock) our garage was invaded by field rats. They chew through my Rubbermaid bins and got into all of my food inside (pouches from church cannery). I was only only to save about 3 pouches of oatmeal. The rest had to be thrown away. Bummer. Looking forward to checking out the rest of your blog! I store my cereal boxes horizontally with the top facing you so you can see the name. You will be able to stack more boxes on your shelves if you do it that way vs. vertically as pictured in this blocg. I have found buying my oats in bulk is a huge savings. I buy them where I get other bulk items – Winco in my area. I ask a store employee to sell me a full 20# bag and it is the same price per pound. I watch for it to go on the 'green tag' price sale. I have found it also at the co-op store here in large bags. I use 5 gallon buckets to store it in since the height of those fit nicely under my shelves. I noticed you might not respond to questions on this blog, but I thought I'd try any way- so do you simply pour your whole pasta supply into those big rubbermaids with nothing else to protect it? I am also VERY inspired by this post. Thanks so much for sharing! Great tip on the cereal stacking! I will have to try that. Great question about the pasta. NO, I don't dump the pasta out of the box. I just put the pasta (in the box) in the tote. This will help them stay a little more fresh and seems to work well. I guess those all are wooden shelving. I am also looking for shelving in my shop but thinking of metal shelving i guess this is a good option. Reviews?? I have found buying my oats in bulk is a huge savings. 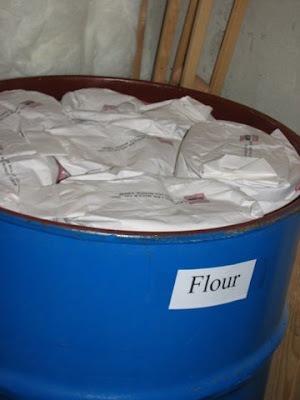 I buy them where I get other bulk items – Win co in my area. I ask a store employee to sell me a full 20 bag and it is the same price per pound. I watch for it to go on the 'green tag' price sale. I have found it also at the co-op store here in large bags. I use 5 gallon buckets to store it in since the height of those fit nicely under my shelves. I like your idea of things stored in the large barrels, but I did store things like that and some of the stuff went stale and got bugs. I now vacuum seal the flour that I don't oven can and I take the cereal out of the boxes and store them in quart mason jars. Three jars per box of extra large cereal. The up side to this besides the fact that you can have multiple kinds of cereal in your pantry without having a ton of boxes open is that they never get moth infestation. Thanks for all the tips. What happens if the grid goes down? What happens to the food in the freezer?